Looking back over what has become a nearly been a five year endeavor, Wrong Side of the Pond has come a long way from its humble beginnings. Originally, it was nothing more than a way for me to pass the time while living in a new town. And I can easily say that I would have never imagined at the time that my blog would grow to have well over a thousand Twitter followers or nearly five hundred Facebook likes. And to see it evolve to become a resource for people to find a place to watch and share beers with fellow supporters, have it gain me media credentials at MLS stadiums around the country, or co-host a weekly podcast? Well, that’s just mind-blowing. However I’d also be lying if I said that, deep down, I didn’t have dreams of it some day becoming more. I’ve always had a desire to somehow stay involved with the game I grew up with and that gave so much to me. Yeah, I still play regularly. But as my fitness and athleticism fade with age, sharing all of the knowledge I’ve picked up over the years of playing and studying soccer seemed like the logical next step. There have definitely been some lucky breaks here and there, too. Bundle all of that with a desire to create and share, and maybe the blog and its growth makes a bit more sense after all. 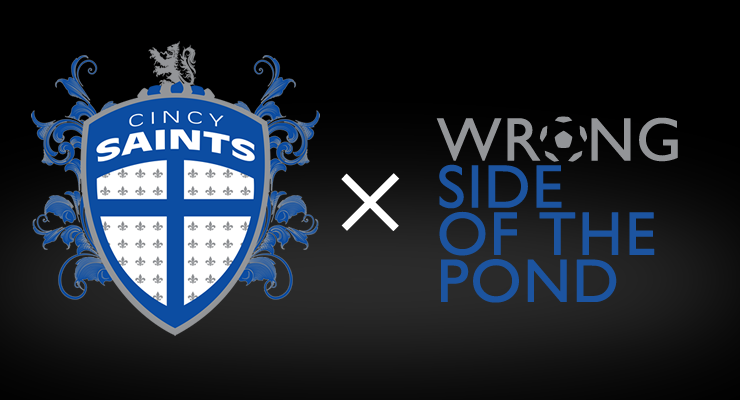 Wrong Side of the Pond will be partnering with the Cincinnati Saints for the upcoming National Premier Soccer League season and beyond! Specifically, my fellow WSOTP Podcast co-host Jeremy Lance and I will provide the official live match commentary for all home broadcasts for the Saints’ 2014 NPSL campaign. In addition to calling the matches at Over-the-Rhine’s Stargel Stadium, we’ll also provide pre-game, half time and post-match analysis and content alongside sideline reporter Amy Hellkamp. More information about broadcast availability will be forthcoming, but for the time being, every home match will at least be available via a free live stream on YouTube — which I’ll be adding as a link in the sidebar prior to the season. Furthermore, we will also be working together on a number of marketing endeavors to help further exposure of both the Saints and WSOTP. Exciting things are already in the works, so keep your eyes on this space for further updates in the weeks to come. In short, I’m extremely grateful for the opportunity and I know we’re all excited to see where things go from here. Many thanks to everyone who’s supported us along the way, and we look forward to cheering on the Saints with you in the summer! The Saints will be embarking on their inaugural season in the National Premier Soccer League (NPSL), a semi-professional soccer league in the fourth tier of the American soccer pyramid. Founded in 2009, the Saints organization also features a men’s indoor side — competing tomorrow in the Professional American Soccer League (PASL) playoffs — as well as women’s indoor and outdoor sides, too. For outdoor matches, the black and blue will call Taft High School’s Stargel Stadium near downtown Cincinnati home. The first home match of the season will kick off at 7:30pm on Friday, May 23rd. Click here to see a schedule of matches. If you want to read the full press announcement on the Cincinnati Saints’ website, feel free to click here. DJ, AMAZING!!!! So proud to see how doing what you love gets better every year. You continue to give us your best…….. and I dont even understand half of what you are talking about!!!! !